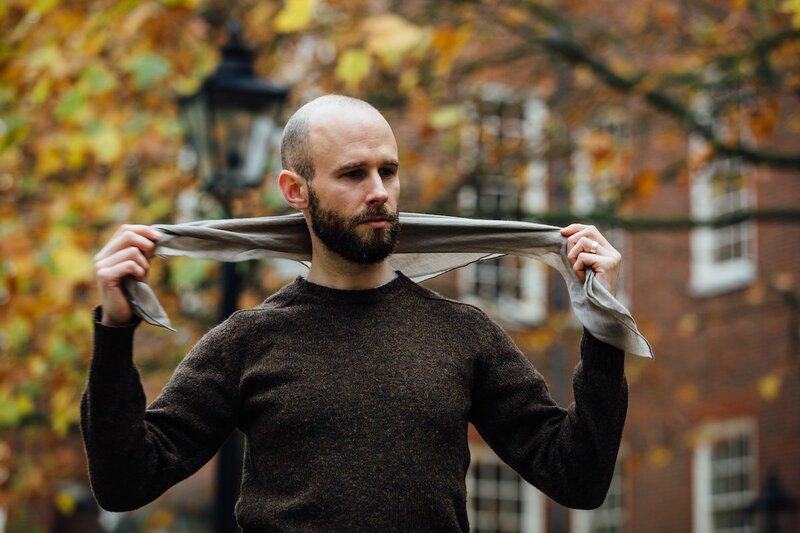 The small, fine cashmere scarf I designed three years ago with Begg & Co - intended to be worn on cold days tucked into knitwear - is available again. It's on the PS Shop now, in grey, navy and green. I've reproduced some of the description from November 2015 below, with the original thought process and product details. If anything, it seems more relevant than ever, and the experiences more true for three years of consistent wear. We worked with weavers Begg & Co on our own, modern equivalent. It's a square scarf in ultra-lightweight cashmere, beautifully soft and luxurious, that is designed to be tied and tucked into a sweater. I’ve been wearing mine regularly, and find it particularly nice when a big, long scarf feels cumbersome - but having something against the neck is great to keep out the morning chill. The three colours - navy, grey and green - go with the whole range of knitwear, just some of which is shown here. 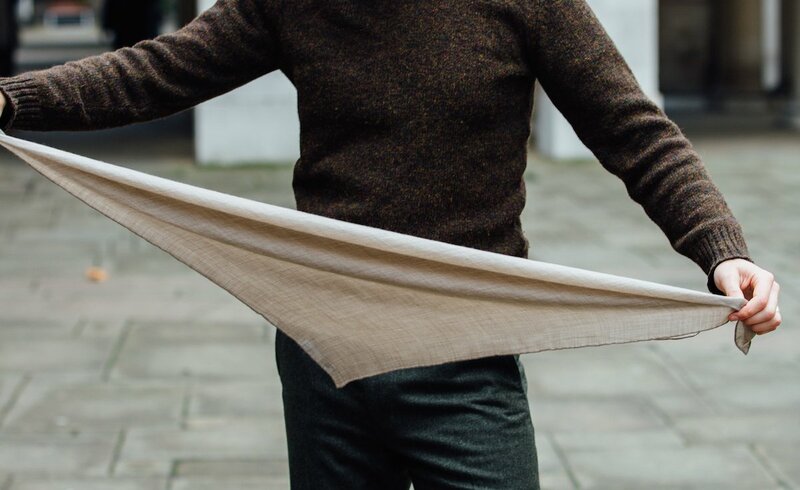 If one thing sets the squares apart, however, it is the Wispy cashmere they are made of. 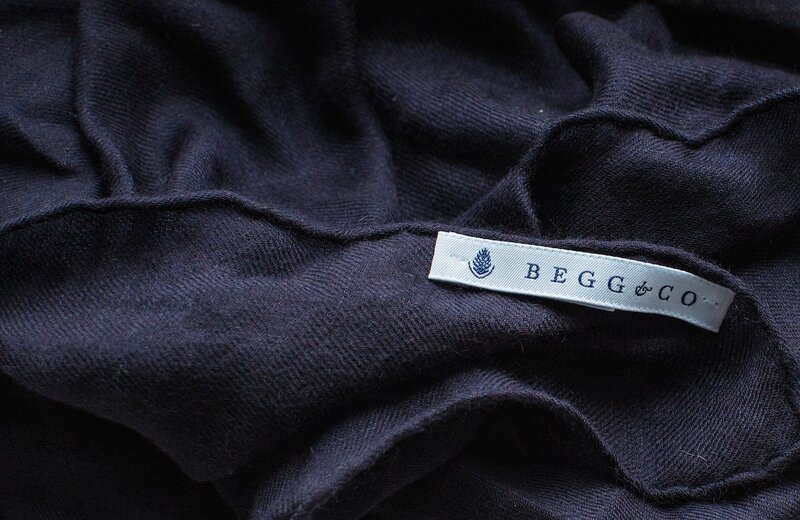 Begg developed the Wispy with an ultra-fine white cashmere fibre. It’s so fine that it would normally snap under the tension of a loom, but they use a patented coating on the cashmere to allow it to be woven, and then wash the coating out afterwards. The scarves are woven in Begg’s Scottish factory, on the west coast in Ayr. Begg has been the premier scarf manufacturer in the country for decades, but until recently only made for other brands (including some of the biggest designer houses). We also decided to give the scarves hand-rolled edges, like a good handkerchief. Of course, hand rolling adds considerably to the time of production and cost of the product. But I wanted to produce the absolute finest piece I could – and the wispy cashmere deserves it. The scarf is designed to be folded along its diagonal, creating a triangle, and then tied at the front (as shown above). 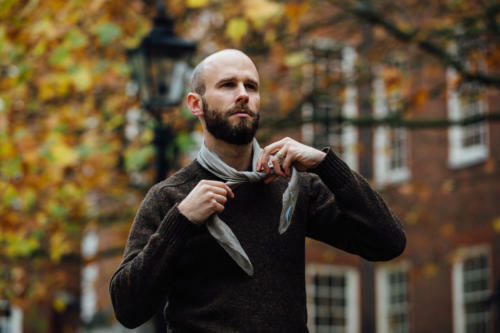 The great thing about folding this way is that the point extends down the back, preventing the scarf from riding up and exposing the skin to the cold. The knot can be a simple over-and-under (like an ascot), a square knot, or even a four-in-hand. Personally, though, I prefer a simple over-and-under, as it's the easiest and least fussy. It can also be nice to wrap the scarf around twice before knotting. This creates a thicker band of cashmere, and is chunkier but warmer. The shop also has a very small number of PS scarf rings available, which were designed in conjunction with Alice Made This. 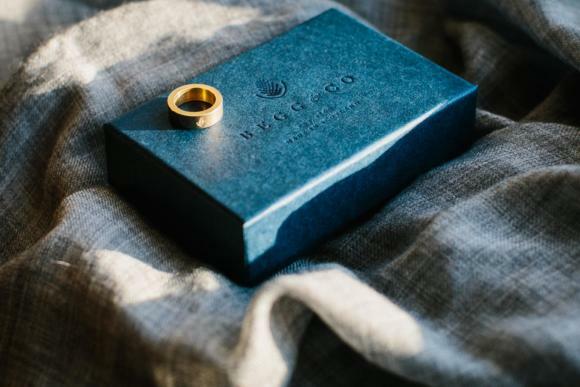 The problem with most scarf rings is that they are usually decorative and fancy, often gold-plated. To counter this, we used solid brass (which looks substantial), tumbled it (which looks worn and matte) and made it highly practical. The brass is uncoated, so it will tarnish over time (or can be polished to bring it back). The inside of the ring also naturally polishes with the action of pulling the scarf through repeatedly, creating a nice contrast. You can follow the discussion on The PS square scarf: available again by entering your email address in the box below. You will then receive an email every time a new comment is added. These will also contain a link to a page where you can stop the alerts, and remove all of your related data from the site. Shame that the natural colour isn’t available. It would, arguably, be the most useful colour. 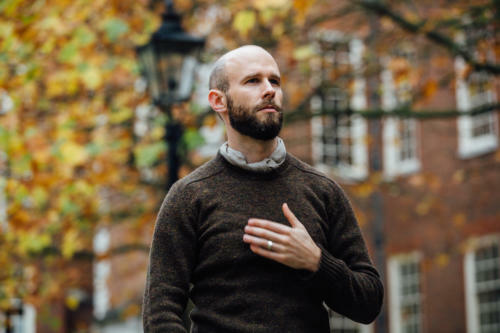 Given the exposure direct contact with skin oils and sweat, how often would you need to dry clean this neckerchief or other scarves in general…I wear my Begg Kishorn and Burberrys often. Also, any tips on getting rid of the inevitable pilling, even on such finely made cashmere items? Good questions. I’ve found I only clean them once a year at most. The pilling I’ve found is quite minimal, unless I haven’t shaved and have a lot of stubble on the neck. But cleaning once also helps there. Have you tried washing it in the washing machine? Any plans to make the ‘natural’ colorway available in the near future? as in your photograph today! I’m not quite sure whether you’re being sarcastic Peter! To a newcomer it could seem unusual, and you won’t see many on the street. 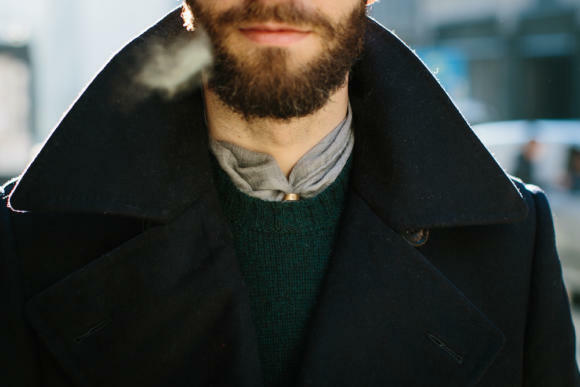 But to the menswear obsessive and Pitti follower, it is a trope so common as to almost be clichéd. The essence of the issue of sprezzatura in a nutshell. No, I’m not being sarcastic. I always except in summer wear gloves – lined and unlined Dents – when I’m under wegs. I’ve forgotten a pair of gloves I put on the small desk in front of me while sitting in one of those seatd in opposition on the train because my attention was diverted, but the Dents gloves were not brought to the Lost & Found. Do take up the gloves in breast pocket angle! Simon, I would not presume to doubt your views were it not a profound matter of conscience. But after a period of mild mortification and calm meditation, I cannot surpress the still small voice that tells me that the gloves-in-pocket trope is exactly the sort of thing which should be resisted at all costs. I’m not sure I can think of anything which more perfectly illustrates the preciosity which characterises the land of “too far”. It may be Italian style of a sort, but chiefly found in the denizens of Dante’s second, third and fourth circles. OK maybe a little strong , but putting it another way, the look -if it has a name- is “man who works in men’s clothes shop”. Pull back from the edge. Look at anything other than your reflection. The circle must be broken. With respect and hesistation, but ever sincerely and with your best interests at heart. I appreciate the circumlocutory concern. And I would agree the vast majority of the time. I do think there can be exceptions though. 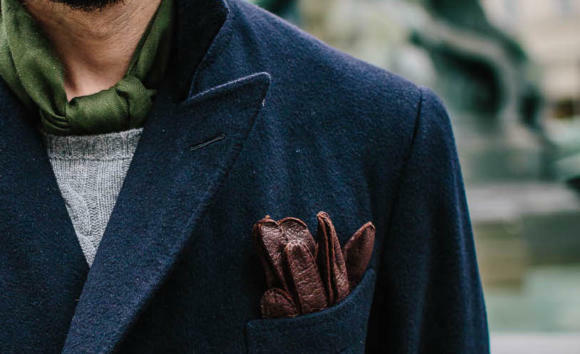 If no one you know or see does this, so there is no suggestion of copying, and you merely wear dark-brown gloves shoved down inside the pocket of a navy overcoat, with no other attempts at sartorial flair, then I think it would be fine. I think this is largely because it’s just practical. It’s a useful places to put your gloves. Unlike, for example, most people who wear a tie clip. I’m glad I got that off my chest. I always put my gloves in the side pockets. Can’t see the problem plus it helps to remind me which is left and which is right, when my mum’s not around to help. In all the outpouring about the sprezzatura I forgot to say though that the square looks great. Really good idea. For some reason I can’t put my finger on bare crew necks just don’t quite look right most of the time, and this provides an alternative to having to wear a shirt . In the early 80s I used to wear a rather lovely red and green silk square in this way under crew necked jumpers. I wonder where it is now. Incidentally along similar lines I wonder whether the cravat will ever return to mainstream dress. There’s a lot to be said for them. But they got stuck somewhere between Roger Moore in the Persuaders and metonym implying pretension in Fawlty Towers. 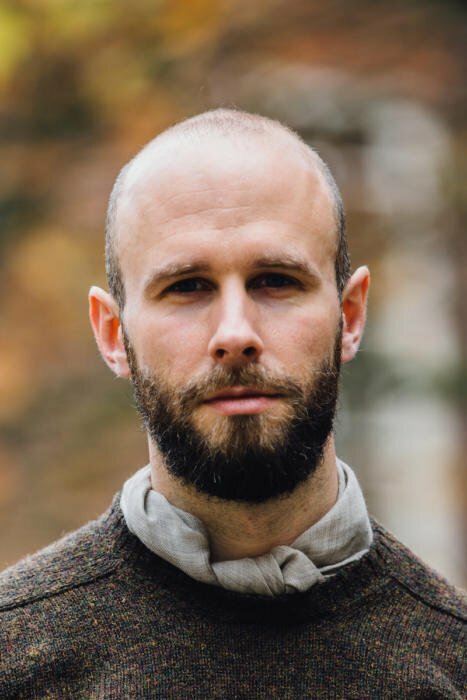 Hi Simon, a little off-topic but can you share the details on the bottle green crew-neck pictured with the pea (bridge?) coat above? Exactly what I was thinking! Also the details of what looks like a Brown flecked shetland crew-neck please? That’s a beautiful sweater. Would you wear it under a jacket or is it too thick? 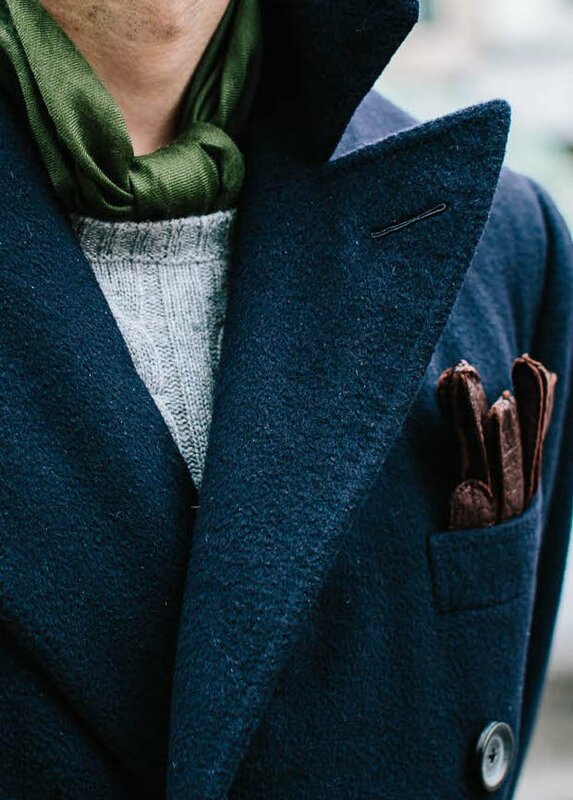 Nice combination of navy jacket, grey knitwear with your great green scarf as colourful spot! In the absence of natural would you recommend navy or green to go with predominately grey and navy Shetland crews and navy and green outerwear? Can you add some more pics of the grey one and comment on its versatility please? Love the gloves in the pocket and I try to mimic it often. I must not be doing it right and gloves droop over. Simon what suit is that grey glencheck(?) one? 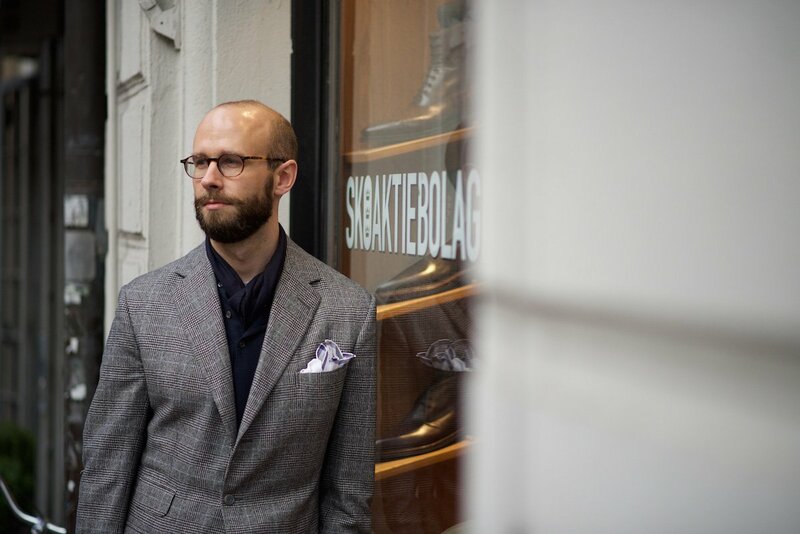 It’s from Anderson & Sheppard – my first ever Savile Row suit. See here.